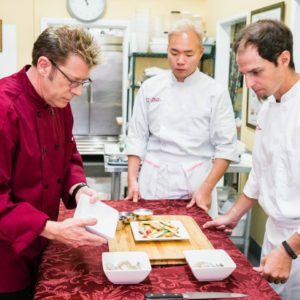 If you are passionate about cooking, ready to boost your confidence in the kitchen, or thinking about a career as a professional chef, we have the perfect culinary cooking class series. Our 14-Week Professional Master Chef Certificate Program will teach you all you need to know to succeed in today’s restaurant environment. This French-based system is a comprehensive cooking program designed to teach in individual modules that build from Knife Skills, to Sauces, to Vegetables, to full Meals. Recipe Development and Costing are key components of this program. We offer career guidance for those who are ready to embrace their passion and pursue a life in the culinary arts. We have students working for Wolfgang Puck at Spago, at Hinoki and the Bird, as Chef’s in the finest restaurants across the world, as Personal Chef’s in homes everywhere, as Caterers, owners of their own businesses, at the mom and pop cafe’s down the street – many times as owners! Where do you want to be? Many of our students are cooking professionally in cafes and restaurants, as caterers and as personal chefs, or own their own businesses. Others have found culinary confidence in their private kitchens cooking for family and loved ones, hosting dinner parties and creating wonderful meals. 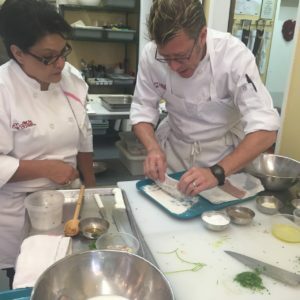 Our classes encompass current cooking techniques and original recipes to rival the finest dining establishments and culinary publications so that your meals and desserts are timeless and treasured. Check out our Alumni here. And add your name to the list! Note: For more information, including special dietary considerations, payment plans, or auditing a class free of charge, please see our FAQ page or email cheferic@culinaryclassroom.com. 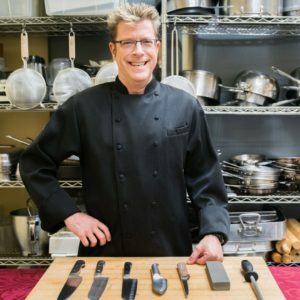 Class #1 – Introduction to the Kitchen / Knife Skills – Here we start with a strong foundation for your culinary education – the fundamental concepts, skills and techniques of basic cooking with emphasis on ingredients, cooking theories and techniques. Sanitation Instruction and Kitchen Equipment usage are emphasized. And don’t forget that essential of any kitchen – knives. We’ll cover the selection, use, sharpening and care of knives as well as how to masterfully Julienne, Batonette, Paysanne, Oblique, Tourne and Dice. Class #2 – All About Stocks – Learn the secrets of flavorful stocks and strengthen your foundation as a Master Chef. Starting with the standard mise en place, sharpen those knife skills by slicing, chopping and mincing mirepoix for all types of white and brown stocks. We make traditional Vegetable, Chicken, Beef and Seafood stocks – we roast bones for the stocks. Next you’ll get up close and personal by familiarizing yourself with seasonings and aromatics used in stocks, soups and sauces. 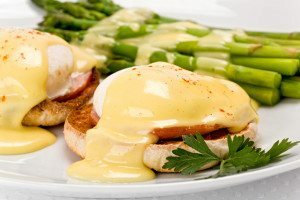 Class #3 – Grand Sauces – This class will open your eyes to the elegant power of clarified butter and roux and how they’re used to elevate Hollandaise, Bechamel, Veloute, Beurre Blanc and Espagnol sauces to luscious new levels. Sauces are the primary foundation of many dishes and this building-block class is an important part of a Chef’s education. Learn to make vegetarian versions of these Grand Sauces and to repair broken sauces easily. Class #4 – Breakfast and Eggs – Traditionally hailed as the most important meal of the day, breakfast is also a very important part of the foodservice industry. This class covers many different ways to prepare eggs, ranging from omelets and poached eggs with Hollandaise Sauce to savory soufflés. Batters and pastry dough skills will also be covered, a traditional staple skill that every professional chef musts have. Class #5 – Vegetables – In a world that is more aware of nutrition and healthful choices, knowing your vegetables is a must in any chef’s education. Vegetables and the unique cooking techniques that serve them best will be discussed in this class, as well as product quality, freshness, shelf life and storage. Vegetarian main dishes and Vegetable side dishes are prepared in this important class, with emphasis on a wide variety of produce and best methods for shopping at Farmer’s Markets. Recipes include classics ranging from Haricot Vert Amandine to Roasted Spaghetti Squash with Vegetable Ragout to Tempura Vegetables to Vegetable Ratatouille and everything in between. Class #6 – Potatoes – A versatile and important product, potatoes take their place in the spotlight in this class. In this culinary cooking class, several different cooking techniques will be discussed and practiced, including Appariel Duchesse, Sautéed potatoes, Pan-fried potatoes, traditional French Fries, Potatoes baked in casserole, and the classic Potato Chip. Most restaurants utilize a variety of potato side dishes for every menu they offer and you will learn a wide selection in this class. Class #7 – Pasta, Rice and Dumplings – Today’s class will make you a maestro of this versatile kitchen staple – starch! Pasta, rice and dumplings are generally made with ingredients that are inexpensive and easily stored in the kitchen. 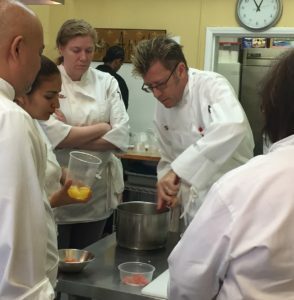 During this class, students get to dig in with Chef Eric to learn the basics of dough and dumpling mixing and create dishes such as Pasta, Spaetzle and Gnocchi. 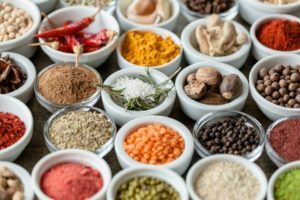 We’ll also learn how additional ingredients such as seasonings, herbs and more can be used to change the color, shape, texture or taste of the final product. We also make Sauces – Pesto, Alfredo, Beurre Noissette (Brown Butter) and Tomato. Gluten-free options are explored in this class. Class #8 – Appetizers and Hors d’ouerves – A classic that is continually reinvented, appetizers and hors d-ouerves are an essential part of any chef’s culinary education. 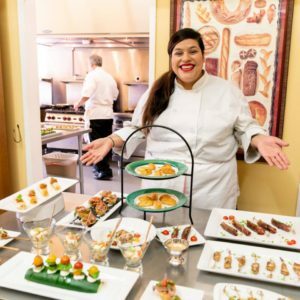 This class focuses on dishes that can function as first courses in a multi-course meal, as well as small items that can be served at a cocktail party or small catered affair. A range of cooking techniques are employed and the only limits are your imagination. Marinades, Sauces, Chutneys and Vinaigrettes are all given their due. Canapés, Satés, Pate a choux and a wide range of other hot and cold hors d’ouerves will also be covered. Class #9 – Garde Manger and Charcuterie – The section of the kitchen that prepares Sausages, Terrines, Pates and smoked items is called Garde Manger, or cold kitchen. In today’s class, students will take on the role of a Garde Manger chef, learning about Sausage making and more. We make Italian-style Sausages and Tex-Mex Sausages in casings and patties. 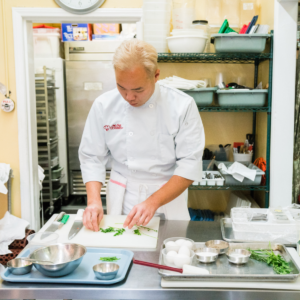 We also create sumptuous Seafood Timbales and tasty Vegetarian Tortas and Chicken Terrines to complete the Garde Manger section of this class; a consistent student favorite. Class #10 – Dry Heat Cooking Methods – Now it’s time to start putting all the culinary knowledge you’ve gained in the previous classes together. This class covers dry heat cooking methods such as Sauté, Broil, Grill and Roast. All students will prepare, cook and serve a complete meal consisting of protein, starch and vegetable, utilizing the knowledge and skills they have acquired in the previous cooking classes. Important techniques of Fish, Poultry, Pork and Beef butchery are introduced in this class. Meal plating and presentation are key components, as students individually prepare, plate and garnish meals worthy of the finest restaurants. Class #11 – Moist Heat Cooking Methods – Moist heat techniques, including Poaching, Steaming, Searing, Braising and using a Court bouillon and Cuisson, are the primary focus for this class. Moist heat cooking is used to produce flavorful dishes by gently cooking the item in varied amounts of liquid, which students use to create a sauce for the finished dish. In this cooking class, all students will again have the opportunity to prepare, cook and serve a complete meal consisting of protein, starch and vegetable, using this newly-acquired skill. Meal plating, garnishing and presentation will continue to be emphasized. 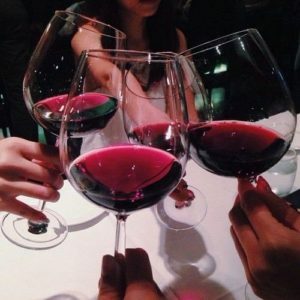 Class #12 – Wine and Food Pairing – A very popular class, Chef Eric constructs a menu with seasonal ingredients and pairs wines that compliment the meal throughout. Walk away from this class understanding how flavors and ingredients interact and the best techniques for creating elegant pairings to create culinary bliss. Learn traditional and comprehensive pairings for each course – including sauces, vegetables, starches, meats, poultry and fish. Dinner party planning is also emphasized. 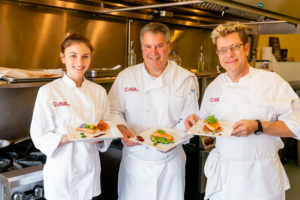 Class #13 – Chef’s Menu – In this class students get to take the spotlight and demonstrate their newfound culinary skills. 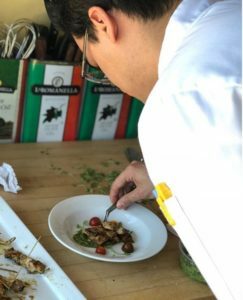 Chef Eric selects recipes for the students to make without substantial assistance and critiques plating, presentation, timing and taste of the menus. 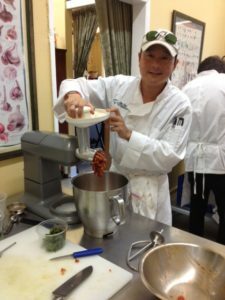 Butchery, sauce making, advanced meal preparation, garnishing and plating techniques are emphasized. Students apply all of their knowledge and skill in this penultimate class. Class # 14 – Final – Plating – Students prepare an intricate menu including an entrée, vegetable and side dish without the use of recipes. A final food tasting, critique and student discussion will wind up the class, followed with a strong finish as Culinary Master Chef Program Certificates are presented to graduates. Timing, plating, garnishing and presentation are essential components to the success of the students’ final menu. Don’t wait to sign up! This program fills up quickly; save your spot today. I want more information about the Master Chef Program!